This Glenfarclas 105 of 22 years old is a Collector edition. This Single Malt is sweet and powerful with slightly smoky notes. The Glenfarclas 105 is a limited edition that has matured for 22 years. It is a whisky both powerful and surprisingly unctuous. Energetic at first, the Single Malt is also warm with its slightly smoked tips. Aged of 22, it was bottled at 60% ABV in the tradition of the 105 editions of the distillery. The distillery imagined the bottling Glenfarclas 105 of 22 years to mark and celebrate the 50th anniversary of this edition. 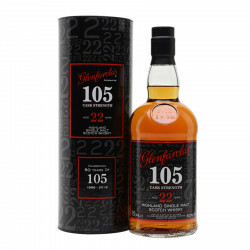 Indeed, Glenfarclas 105 was launched in 1968. This whisky was originally served by hand directly from the cask and distributed to distillery employees as a Christmas present. The tasting with a bit of water allows to develop all the depth during the tasting. Nose: notes of malt with salted butter, notes of dark chocolate and cigar box. Palate: walnut, honey, prune, cinnamon and nutmeg, tobacco and earthy oak. Finish: sherry spice with notes of coffee bean.